Monday 25th May - Friday 29th May - Week 6 Reading –10-15 minutes each night. RAZ KIDS - I have set a Flight Check for the students to be completed by Tuesday 2nd June. Monday - G.9Tuesday - Year 5 - E.2Wednesday - Year 5 - E.3 Thursday - Year 5 E.4 This is done to a maximum of 15 minutes. Times Tables - Focus is on 7 Times Tables this week. I sent home a link for an App to be downloaded that will help speed up recall of given tables. This is done to a maximum of 15 minutes. Spelling -students will complete a Look, Say, Cover, Write, Check of all of their list words using the given framework. I ask that their words are corrected, either by you or by the student. 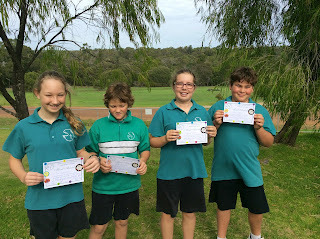 Congratulations to Lahni, Zoe, Matt and Damon for their awards this week. They have been working so hard and I am very proud of them! Aladdin is fast approaching...we are putting out the call for some props that we can use for this year's production. If you are able to assist with any of these items, we would be very grateful! Monday - J.1Tuesday - N.4Wednesday - H.7Thursday - H.8 This is done to a maximum of 15 minutes. During class Mrs Allison came in to teach us which vegetables to grow during Autumn. The food we are growing will be passed to St Vincent De Paul to be given to people who are struggling and need some food for their families. The vegetables we planted to grow are lettuce, spring onions, pak choy (Chinese cabbage), broccoli and kale. We have learned that if we grow these vegetables during summer they start to grow flowers which makes them bitter which does not taste very good! We have been having such great fun learning with Mrs Allison - thank you!